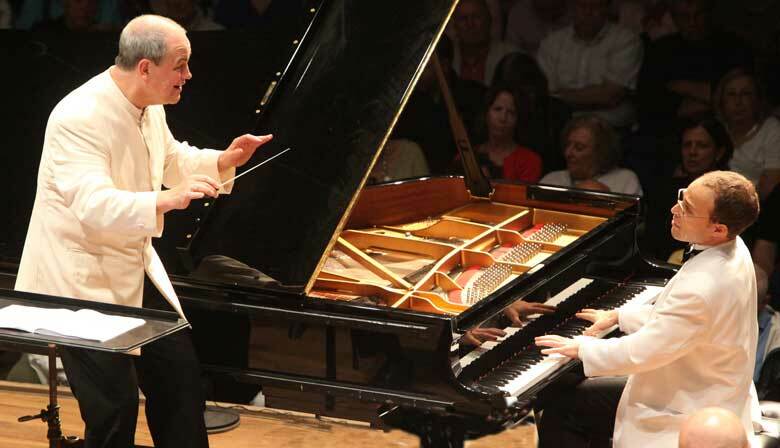 The Serge and Olga Koussevitzky Memorial Concert at the Shed at Tanglewood on Friday, July 29, promised music by Mozart and Mahler, Hans Graf as conductor and Leon Fleischer as soloist. Due to “a temporary focal dystonic setback in his right hand” announced this Wednesday, Fleisher did not perform. So Orion Weiss made his Boston Symphony debut in Mozart’s Piano Concerto no. 25 in C, K. 503 (not Piano Concerto no. 12 in A, K.414 as originally announced) in Fleisher’s stead. The program concluded with Mahler, Symphony no. 5. The Mozart we heard was delicate, graceful, and reserved. Orion Weiss performed his own cadenzas that were thicker in texture than the surrounding concerto, and populated with species of post-classical harmonies. He offered a polished reading; drama came from intense rain localized during his performance, depriving soloist of the full attention of audience and musicians and overwhelming the delicate articulation and subtle dynamics. I hope to hear Weiss again, the better to judge his playing; my impression from this concert is that he is a skilled pianist with interesting musical ideas and the technique to deliver them effectively to audiences. After intermission, Graf conducted the Boston Symphony in the Mahler Fifth. This is a sonic world greatly removed from that of Mozart; Graf remained reserved. Part I opens with a Trauermarsch; this one was stately, and the movement, with wonderful solos by principal trumpet and star turns by other brass players, remained aloof. The second movement Mahler marked as Stürmisch bewegt, mit größter Vehemenz (Stormy, with utmost vehemence); there was nary a cloud in this nighttime sky. Part II is the Scherzo in which the members of the BSO exhibited energy and irruptions of passion. Part III opens with the fourth movement Adagietto, which can be a work of haunting beauty and extreme pathos. The Rondo-Finale depicts a lively world distant from the opening funeral cortège, counterpoint themes bouncing along. I heard intimations of what Mahler composed, but diminished in affect. On the whole, Hans Graf led the Boston Symphony Orchestra in a dispassionate reading. Given how much of his life and anguish Mahler poured into his compositions, I find the more emotional readings conducted by the likes of Bruno Walter, Leonard Bernstein, or Marin Alsop to be more compelling. This is a different take on Mahler than when Levine led the BSO. One difference is that Levine conducts on the beat, but Graf belongs to the school of conducting that anticipates the beat. Factor in Graf’s appearance as a visiting conductor, and the limited rehearsal time. I have often wondered how orchestral musicians adjust to different, visiting conductors — especially when it is a conductor who anticipates the beat. Tonight we heard that this adjustment is not always smooth and easy. Clearly the orchestra needed more time to adapt to Graf’s style. The orchestra stumbled into the Allegretto in the Mozart; the principal trumpet took the lead starting the Mahler. I think the musicians were focused on keeping the rhythm together and the interpretation, the musical narrative, suffered as a consequence. Beyond this matter of technique, is there a difference of musical interpretation? It would be interesting to know if Graf thinks he achieved the interpretation of the Mahler Fifth he intended, and if he was content with the performance; I regret to report that I was not. Agreed. Graf conducted Mahler’s Fifth without an interpretation. It was loud, it was amped up but it was unengaged with the work. The orchestra sounded great but there was little texture and variation within the movements. There was no emotional or even tonal narrative. There was also little difference in Graf’s conducting of Mozart and Mahler. I understand that Weiss was a replacement but would it have killed Graf to have tried to communicate with Weiss’s playing? Mahler 5 is not music for Tanglewood Shed. Mahler 5 is something that bunch of marionette puppets play in well-controlled concert halls with stone walls. To play Mahler 5 in the Shed is like to dry-age beef in public restroom of Greyhound bus stop. Since it was the Tanglewood Shed and since it was Hans Graf than he had to be trying to play in there Bruckner 5 not Mahler 5. I attended the closed rehearsal and not the actual concert. Sitting where I could see and hear Hans Graf I marvelled at his respect, clearly communicated vision and emonstrable passion for Mahler as well as his introduction of the lastminute soloist to the orchestra and support he gave them. During the rehearsal my husband and I were deeply moved by the famous adagio and the rousing 5th movement with eloquent brass and horns that literally made our stand on end. either there was a radical shift in the actual performance or our sensibilities are drastically different than the critics. For those at the rehearsal spontaneous applause and admiration were displayed.